JVS-D9000-SZ Network DVR is one model of high-end DVRs released by Jovision lately.This DVR applies most advanced Video & Audio Processing chipset, adopts the cutting-edge Video pre-and post- processing technology and codec algorithm, and is integrated with HDMI output, which can offer excellent image quality for users. JVS-D9000-SZ Network DVR is developed with the ideology of user-friendliness. Users can learn the operation of the DVR relying on the boot wizard and functional demo. The interface of this DVR is very easy to operate. 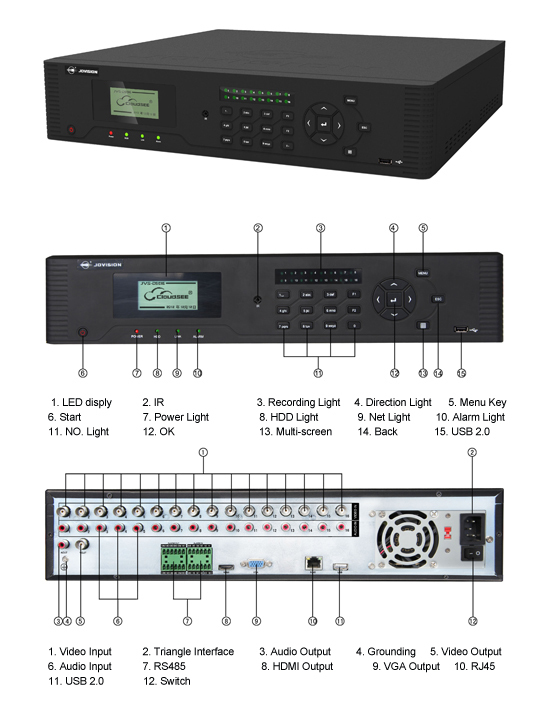 What’s more, this DVR is integrated with perfect function and safe design, such as LCD display on the front panel, customized displaying information. HDD mode can be Stopped or overwrite, which make safer for records. With the functions of Scheduled restarting, scheduled log off, and automatic network time applied, it is not need for manual setting time .